The Orce region has one of the best late Pliocene and early Pleistocene continental paleobiological records of Europe. It is situated in the northeastern sector of the intramontane Guadix-Baza Basin (Granada, Andalusia, southern Spain). Here we describe a new fossil hominin tooth from the site of Barranco León, dated between 1.02 and 1.73 Ma (millions of years ago) by Electron Spin Resonance (ESR), which, in combination with paleomagnetic and biochronologic data, is estimated to be close to 1.4 Ma. While the range of dates obtained from these various methods overlaps with those published for the Sima del Elefante hominin locality (1.2 Ma), the overwhelming majority of evidence points to an older age. 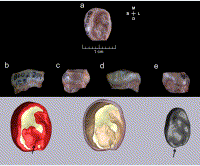 Thus, at the moment, the Barranco León hominin is the oldest from Western Europe. Figure 2. Upper: Tooth specimen BL02-J54-100, left dm1 from Barranco León D. a: Occlusal view; b: Buccal view; c: Distal view; d: Lingual view; and e: Mesial view. Lower: Computed tomographic reconstruction of the enamel and dentine surfaces (left and center) and the pulp cavity (right) of the dm1. The arrow points to the presence of a small hypoconulid. Figure 3. Archaeological evidences from level D of Barranco León. a: Refitted pieces; b: Retouched piece; c: Striation and one polished marks; d–f: Bone cut marks, BL03-L62-2, rib fragment of megaherbivore (cf. Hippopotamus antiquus), it shows a long and curved cut mark oblique to the major edge of the rib in the central area of the bone, which is related to the evisceration process; g: Bone impact point; h–i: Bone flakes. Note: All lithic and fossil specimens shown in this figure were found during the excavations at Barranco León by the members of the research team that coauthor this article, with the only exception of specimen BL95 C1 A3 n.15, the central piece of the refitting group of Figure 3A, which was published in Gibert et al. (1998b).